Ohio State students now have a special place to grab a quick snack before finals. Unless you're a vegetarian, there are few things more comforting than the smell of bacon sizzling away in the morning — and, of course, the promise that you will soon get to eat said bacon. But what if you didn't even have to wait for that bacon to cook? That's the idea behind a new vending machine that was recently installed at Ohio State University. On Tuesday, the Ohio Pork Council launched its first Bacon Vending Machine at one of the country's largest universities, and it will supply hungry students and professors on campus with ready-to-eat bacon snacks from now through Dec. 13, so everyone can get their fill of pork products during the busy finals season. “The Bacon Vending Machine is a unique and fun way for the Ohio Pork Council to support Ohio State students and promote the pork industry at the same time,” Dave Shoup, the president-elect of the Ohio Pork Council, said in a statement. In addition to pre-cooked bacon strips, the machine also stocks bags of bacon bits from big companies like Smithfield, Hormel and Sugardale. The machine isn’t all about the greasy breakfast staple, though. Proceeds from the bacon vending machine will benefit (what else?) the school’s meat science program. Since the companies donated the shelf-stable bacon products to fill the machine, each snack only costs $1. The machine was created by the Ohio Pork Council in partnership with the We Care initiative, which supports farmers’ who commit to practicing environmentally responsible and ethical animal agriculture. But with bacon being such an obvious crowd pleaser, should we be expecting more of these vending machines to be popping up at other campuses across the country? “The future of the bacon vending machine is still unknown ... we may see it appear again, or maybe not. Time will tell! Currently, this is our [only] bacon vending machine,” Emily Bir, director of communications for the Ohio Pork Council, told TODAY Food. 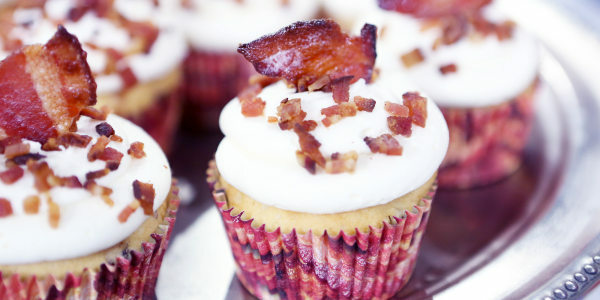 If you can't make it to Ohio State by Dec. 13, just enjoy some of TODAY Food's favorite bacon recipes to satisfy any sweet and crispy cravings.